This entry was posted in Academic achievements, Academics, General News, Students and tagged Rhodes Scholar on October 30, 2012 by Wire Eagle. 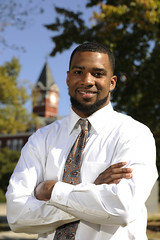 AUBURN UNIVERSITY – Auburn University senior football player Ashton Richardson has been named a finalist for the Rhodes Scholarship, marking the fourth straight year an Auburn student-athlete has become a Rhodes finalist. The Rhodes Scholarships, founded in 1904, are the oldest international fellowships. Winners of the scholarship have the opportunity to do graduate work at the University of Oxford located in Oxford, United Kingdom. “Ashton is an ideal representation of whom my office seeks to endorse for the Rhodes Scholarship. He is someone who combines a sound intellect and puts it to good use by making good grades and engaging in the undergraduate research experience; someone who channels his energy for the betterment of our world, for others who are less advantaged and for those who struggle every day; and he is someone who lights up the room when he is around,” said Paul Harris, Auburn associate director for national prestigious scholarships. Richardson is an Honors College student majoring in animal sciences with a concentration in pre-veterinary medicine in Auburn’s College of Agriculture, earning a cumulative grade point average of 3.94. He is a three-time SEC Academic Honor Roll honoree and earlier this year was a semifinalist for the National Football Foundation Campbell Trophy, which is presented annually to the top football scholar-athlete in the country. Richardson, who grew up helping his father raise quarter-horses, has aspirations to become an equine surgeon. The four-year letter winner at linebacker has played in 32 career games, registering 13 tackles. In 2012 Richardson has played in all eight games, making four tackles, recording one sack and recovering one fumble. He walked on to the football team as a freshman and earned a scholarship prior to his junior season. A New Orleans, La., native, Richardson is writing his Honors thesis tentatively titled “Comparison of Articular Cartilage Thickness in Cadaveric Equine Limbs” under the direction of Reid Hanson, professor of equine surgery in the College of Veterinary Medicine. He is scheduled to graduate from Auburn in December. Off the field, Richardson has volunteered each week for the past four years as a mentor at the Lee County Youth Development Center. “When I was first notified that I was a finalist, I was so thankful to God and to all the people who have helped me,” Richardson said. “I was overwhelmed with a sense of humility. When you realize how prestigious and competitive the Rhodes Scholarship is, having the chance to try for it is a dream come true. I will give it my all to make Auburn proud and represent all the people on campus who have worked with me and believe in me. If awarded the Rhodes, Richardson plans to pursue degrees in biodiversity and environmental fields. Richardson is the fifth Auburn student-athlete to be named a Rhodes finalist in the past four years. Other past finalists include former diver Dan Mazzaferro, swimming and diving student-athletes Erica Meissner and Jordan Anderson and former gymnast Krissy Voss. Anderson won the Rhodes Scholarship in 2009. The next step for Richardson is a two-day interview process. He will appear before the District VII Selection Committee Nov. 16-17 in Birmingham, joining 12 other finalists from the district. Two finalists from District VII will be selected as 2013 Rhodes Scholars.